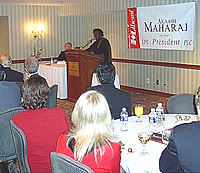 Akaash received a standing ovation from a sold-out, capacity crowd during a 20 February fundraising reception held by his supporters in the National Capital Region. "It feels like the days of Trudeaumania," said George Devine, President of the Ottawa - Vanier Federal Liberal Association as he surveyed the crowd's reaction. 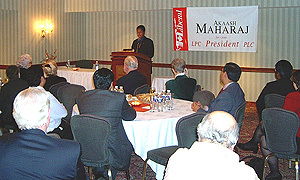 Speaking at Ottawa's Sheraton Hotel, Akaash addressed an audience of MPs, riding presidents, long-time Liberals, and Canadians just recently inspired by his campaign to enter politics. He called on them to help transform the Liberal Party into a more vital and more accountable vehicle for civic engagement in public affairs. "Our Party has for too long laboured under a tyranny of low expectations," Akaash said. "In a democracy, we never receive the government we deserve; we only receive the government we demand and the government we help to create." Akaash also fielded questions from the audience, and remained speaking with individual attendees late into the night, on subjects as diverse as financial accountability; how to increase youth and Aboriginal participation in politics; and the relationship between the parliamentary and civil wings of the Party. 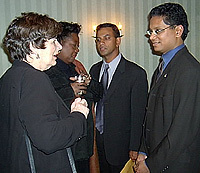 "Akaash is a real leader," said the Hon Jean Augustine, Canada's Secretary of State for Women. "He just has what it takes."